What is a “Hopia” you asked? Hopia is a popular Filipino pastry filled with bean paste which was introduced by the Fujian Chinese during the American occupation. It came from the Chinese word ho-pian which means “good biscuit”, it is nearly similar to moon cake wherein a pastry is filled with a sweet paste and it is also traditionally given as a gift for friends and relative. There are a lot of hopia filling variants but the 2 most popular ones are the Hopia mungo which is made out of mung bean paste and Hopia Baboy which is made out of candied winter melon, green onions and pork fat. Other variants are red bean and ube (yam). 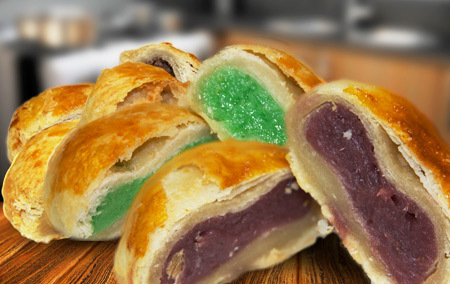 The pastry has different variants as well and the popular ones are the flaky and a pastry similar to moon cake. This particular recipe is made from flour and shortening so the crust is flaky just like that of Empanada and the filling is made with mung bean, the same as that of Butsi. Hopia has long since evolved into different flavors, shapes, fillings and textures. from Kalesa Grill, Oxnard, CA. Highly recommend.